We’ve recently been buying up plenty of wooden toys. After seeing how much Gracie loved her other wooden animals that we’d picked up, I was excited to get the Pocket Dinosaur set for her. This box cost us £15.00 from a high street shop. The box contains 18 pieces, 12 dinosaurs (6 pairs), 4 trees, and 2 volcanoes. While the box states that the toys are suitable from 18 months, Gracie is enjoying them at 13 months, and the size and quality of these toys are equal to that of other toys that are suitable for her age. The 12 dinosaurs are in bright colours that Gracie found really attractive. She loved that there were two of every dinosaur, in two different colours. This gave her the opportunity to pair them together, both by shape, and with other dinosaurs in the same colour pallet. The trees and volcanoes have also found use outside of the set as a part of other small world play. These are not the first wooden dinosaur toys that we’ve picked up, originally finding a couple of Le Toy Van dinosaurs while shopping in Glastonbury, and these compare extremely well. While the Le Toy Van dinos are certainly of a higher quality, this is directly tied to a higher price. 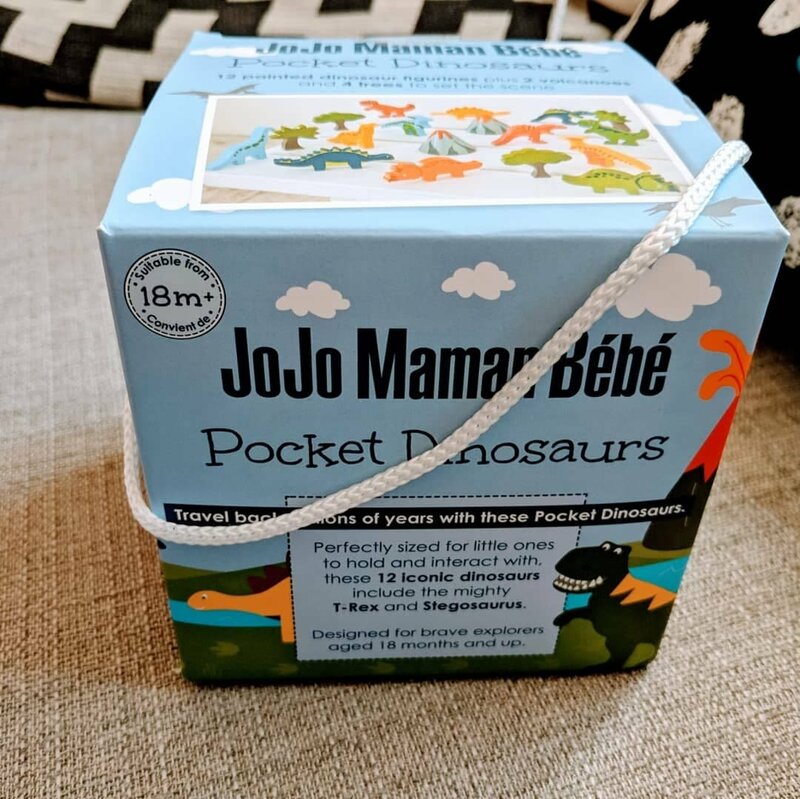 Ultimately the Pocket Dinosaur pack provided a large number of good quality toys that are perfect for those who prefer wooden toys, or small world play, and while not my favorite brand wooden toys, they are great for smaller hands. It has been a little while since we’ve done a review here at Reusable Family. Between increasingly pregnant Mummy giving herself a concussion, and Daddy going back to work it has been hard for us to sit down and just write. But during the time we’ve been quiet we’ve managed to pick up a few bits here and there that we thought we’d like to share. We decided to kick our reviews back off with something so simple, something that was more of an impulse buy that anything planned, Toy Leads by JoJo Maman Bebe. Gracie loves going out and about in her pram, but as she’s gotten older she’s developed a habit for throwing any toys that we’ve taken with us out her pram. For a while the answer for this was to simply only take toys that clipped on to the pram (most Lamaze toys come with a decent clip). This worked well for us until we were in town one day, we decided to purchase a Matchstick Monkey teething toy on a whim (a review of this will be coming soon). This however left us with a little bit of a dilemma, we wanted her to have the toy, but we didn’t want to lose it. We quickly found the answer in JoJo Maman Bebe who sell a 2-pack of Toy Leads for £6. We gave them a little tug, and decided that they would do the job well, and purchased them. We go out everyday, often multiple times, and these leads have been heavily tested already. JoJo Maman Bebe Toy Leads are strips of hardwearing fabric, they come in a selection of patterns and prints, and have a set of poppers/snaps at both ends. One set of poppers attaches to the toy in someway, while the other end attaches to the pram or stroller. These poppers are very strong, and Gracie has yet to managed to get them undone with brute strength alone, giving us peace of mind that the toys are secure and safe. These toy leads have also survived a significant amount of chewing, a couple goes in the washing machine, so far they are as bright as they were when we purchased them. There are certainly other toy leads available on the market, but we have been extremely impressed by these ones. For the reasonable price of £6, you can protect your toys from randomly being thrown from the pram and lost. We wish we’d thought about getting these sooner. 2018; the first year as a whole family. Mummy, Daddy, Gracie, and the two fur babies Pixel and Dora. This year we want to set a good example for our little girl and be as green as possible. Expect reviews, pictures, videos, food, and lifestyle updates. Disclaimer: Most posts are written at 3am with a baby on my lap.